Covering major aspects of health care nursing, this handbook is written from a holistic viewpoint and involves the roles of the multidisciplinary team. It is intended for newly qualified nurses and community nurses and breast care nurses should also find it useful. The text aims to help readers broaden their knowledge about breast cancer and show them how to help patients and their families cope with the diagnosis and treatment of this disease. 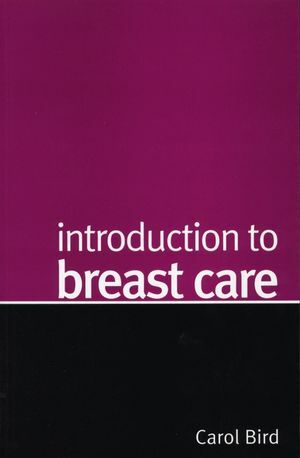 Carol Bird is the author of Introduction to Breast Care, published by Wiley. Chapter 1. Physiology of The Breast. Chapter 2. Breast Awareness and The Breast Screening programme. Chapter 3. Benign Breast Disease. Chapter 4. Diagnosing Breast Cancer. Chapter 5. Surgery for breast Cancer. Chapter 7. Chemotherapy for Breast Cancer. Chapter 8. Radiotherapy for Breast Cancer. Chapter 10. Prosthetics and Clothing. Chapter 11. Psychological and Psychosocial Aspects. Chapter 13. Diet and complementary Therapies. Chapter 14. Fungating Malignant Breast Wounds. Chapter 15. Recurrent Breast Cancer. Chapter 16. Rare Breast Cancers.